I've been longing to weave using my handspun yarn for a while, but haven’t found just the right project until now. The yarn I’ve chosen to use in this project was black and brown merino sliver that I bought from Aurelia Fibers. I then cherry picked a package of ‘firestar’ and pulled out all the weird coloured fibres and just kept the gold and purple. 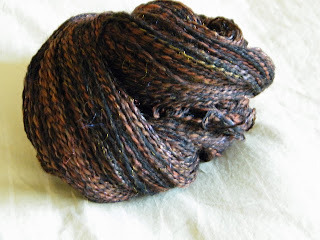 I spun this blend loosely in a semi-worsted style making sure I got a fairly even blend of black and brown. I didn’t have a huge amount of the sliver, and I knew I wanted to use it as warp, so I plied it with a very fine black linen yarn. The idea was to reduce the ‘sproing’ factor and it worked! I’m really pleased with the result! 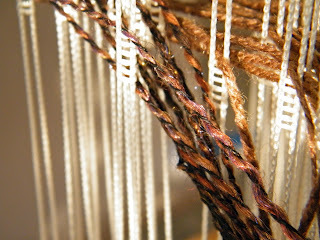 My plan was to weave a shawl using my handspun and some of the new 50/50 Silk Wool blend I’d just purchased. I also wanted to have two unique sides to the shawl and to have surface interest. Here's my draft. I decided to go with an 8 shaft pattern of bands of 1/3 twill and 3/1 twill which will give me pleats of solid brown 50/50 wool silk and handspun on one side and all black handspun on the other. The little bit of 'firestar' in the handspun really makes the yarn sparkle! I didn’t want to use my favourite Schacht end feed shuttle because it just doesn’t hold all that much of this fairly uneven yarn, so I used this 15 inch Little Man Howell shuttle which holds an amazing amount of yarn. What you can get on this shuttle is astonishing! I didn’t have a temple that was wide enough (well, actually I do have one, but it’s a Leclerc rug stretcher and it’s really heavy and so not a good choice for this lightweight fabric), so I made this simple home made version using paper clips, string and weights. It hangs over the sides of the loom and really, really works! I filled film canisters with pennies for the weights ~ this is a great solution and I found the idea here. Side number 1 of my pattern consists of 2 inch stripes of handspun and commercial yarn alternating and you can already see how it’s already starting to pleat! I sett the yarn at 12 epi and hopefully this is not too close a sett. I didn’t want a sleazy fabric and I know that twill needs more epi than plain weave, so I’m still at the ‘fingers crossed’ stage and hope it works out. As you can see from the streaking, my handspun was a tad unevely blended.....ahhh but that's the nature of the beast! Side number 2 was really hard to photograph, but you can just make out the pleats and the all over handspun with each 2 inch stripe. I'm almost finished and can't wait to see how it washes and pleats. 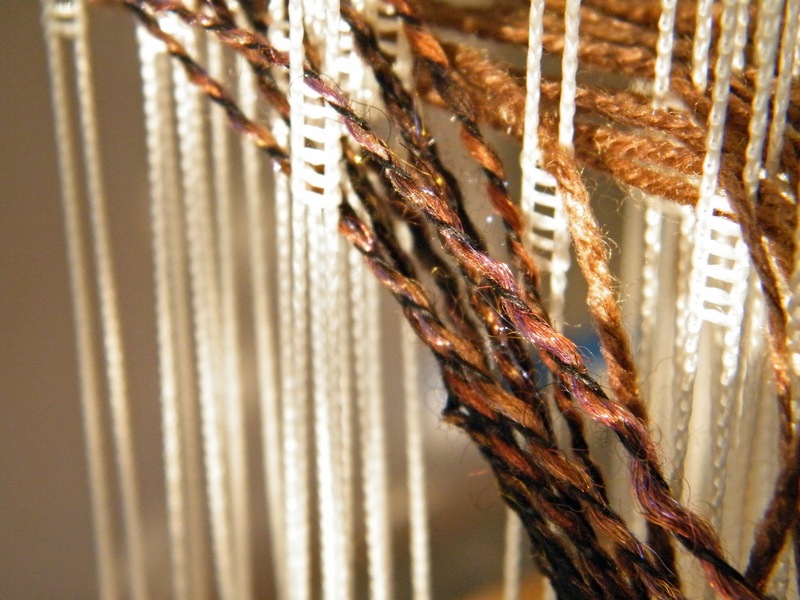 I had the luxury of seeing the warp on the loom in person before you started to weave and I must tell everyone how beautiful it is! Your spinning is beautifully even. I hope the pleating action happens as you hope for, but it will be a success either way! I look forward to seeing how this finishes up, Lynnette! Your handspun is lovely....I also have not had the courage to weave with any of mine yet...but each of these projects that I see take me that much closer. The Mannings has a wonderful sample out of this same kind of project alternating sewing thread with bright strips of tencel. The pleating that results is amazing and the scarf is quite striking. As I said, I look forward to seeing how your two fibers pleat. Always fun to see what you're working on!! I always like to see what you are working on Lynnette. Instead of the paper clip to hold this kind of temple, try a something like a tarp clip (see Lee Valley Tools). You can find them at the local hardware store. They are easy on the selvedges and are easy to move along as you weave. Hi I did find the draft for the bookmarks, in Best of Weavers but won't be using it for the moment as my threading is 8 shaft s & w point for tray cloths.